Going and Growing Green, Year after Year! 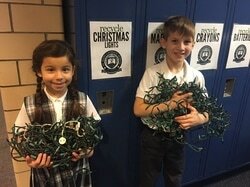 St. Mary School is going green and growing greener and greener, year after year. Scoring 26 points to be named Top Green School in Macomb County during the 2013-2014 school year, St. Mary School continues to add new Green School activities each year. Two big Green School projects this year were the Growing Green Garden Project and the Save the Monarchs Project. For more information and to stay up to date, follow, "Our Greening Efforts," by clicking the link above. Recycling is available at St. Mary School! Collection bins for the following materials are available. Please send any of these used materials to school instead of discarding them in the trash. *Please deposit used paper in the Abitibi paper bin in the school parking lot and for safety, please use electrical tape to tape over all battery terminals. From 1970 to 2012 earth's population of wild vertebrates, including mammals, birds, reptiles, amphibians and fish, have declined 58%. The number one cause of the decline is habitat loss and degradation. Other causes include over exploitation, climate change, invasive species and pollution. Many pollinator species are threatened with extinction, including some 16 percent of vertebrates like birds and bats, including hummingbirds. On May 31, 2017 SMS students and staff will participate in Growing Green Ecology Day. Students will attend a presentation and add plants to school gardens with the goal of certifying SMS gardens as a National Wildlife Habitat and Pollinator Garden in 2017. Energy Waste The United States uses more energy, per person, than any other country in the world. At the current rate of use, oil will be depleted by 2050-2100. The oil that we use to run our vehicles is a fossil fuel which, when burned, releases carbon dioxide which is considered by scientists to be the main chemical warming the earth. To bring awareness of the need to save energy, St. Mary School, under the leadership of eighth grade teachers and students will be going “unplugged”. On the second Monday of each month, beginning on January 11, 2017, once a month, classrooms will operate with no lights and no technology. Classrooms will work by natural light, pen, pencil, and paper. We are asking our families to support this project by refraining from technology (TV, cell phones, iPads, etc.) at home on those dates as well. To prepare to be unplugged eighth grade students create and hang, "SMS Unplugged" posters throughout the school, and parents are asked to support the project via email, and the Growing Green Facebook Page (https://www.facebook.com/StMarySchoolGarden/?ref=aymt_homepage_panel) . Electronics waste disposed in trash receptacles is delivered to land fills where toxic chemicals can leach out and pollute our water, land and air. We recycle all computer equipment and attachments, desktop PCs and workstations, notebooks, laptops, tablet PCs, LCD Monitors, printers, laser and ink jet, ink cartridges, new and used (please bag), keyboards, mice, scanners, audio/video and projection equipment, speakers, old style, digital and video cameras, phones, cell phones, PDAs, calculators, servers and external hard drives, digital photo frames, clocks, personal music players, video games, small kitchen appliances, non-household batteries. AAA, AA, C or D batteries cannot be accepted. We destroy all information. By law we are unable to recycle CRT Monitors or televisions at this time. Donations in support of St. Mary School Green School Program are much appreciated. Your support of this project is important. By properly recycling electronics citizens are able to keep toxic chemicals out of landfills and divert the usable resources in electronics to existing recovery markets to save our natural resources. In addition, donations from electronics recycling benefit the SMS Green School Program by helping to fund green school activities and supplies such as Stream Leaders' nets and waders, eco-friendly books and DVDs for the endangered species bags and media center, and plants for school gardens.